The stock market refers to public markets that exist for issuing, buying and selling stocks that trade on a stock exchange or over-the-counter. StocksStockWhat is a stock? An individual who owns stock in a company is called a shareholder and is eligible to claim part of the company’s residual assets and earnings (should the company ever be dissolved). The terms "stock", "shares", and "equity" are used interchangeably., also known as equities, represent fractional ownership in a company, and the stock market is a place where investors can buy and sell ownership of such investible assetsFinancial AssetsFinancial assets refer to assets that arise from contractual agreements on future cash flows or from owning equity instruments of another entity. Financial instruments refer to any contract that gives rise to a financial asset to one entity and a financial liability or equity instrument to another entity. An efficiently functioning stock market is considered critical to economic development, as it gives companies the ability to quickly access capital from the public. The stock market serves two very important purposes. The first is to provide capitalNet Working CapitalNet Working Capital (NWC) is the difference between a company's current assets (net of cash) and current liabilities (net of debt) on its balance sheet. It is a measure of a company’s liquidity and its ability to meet short-term obligations as well as fund operations of the business. The ideal position is to to companies that they can use to fund and expand their businesses. If a company issues one million shares of stock that initially sell for $10 a share, then that provides the company with $10 million of capital that it can use to grow its business (minus whatever fees the company pays for an investment bank to manage the stock offering). By offering stock shares instead of borrowing the capital needed for expansion, the company avoids incurring debt and paying interest charges on that debt. The secondary purpose the stock market serves is to give investors – those who purchase stocks – the opportunity to share in the profits of publicly-traded companies. Investors can profit from stock buying in one of two ways. Some stocks pay regular dividends (a given amount of money per share of stock someone owns). The other way investors can profit from buying stocks is by selling their stock for a profit if the stock price increases from their purchase price. For example, if an investor buys shares of a company’s stock at $10 a share and the price of the stock subsequently rises to $15 a share, the investor can then realize a 50% profit on their investment by selling their shares. Although stock trading dates back as far as the mid-1500s in Antwerp, modern stock trading is generally recognized as starting with the trading of shares in the East India Company in London. Throughout the 1600s, British, French, and Dutch governments provided charters to a number of companies that included East India in the name. All goods brought back from the east were transported by sea, involving risky trips often threatened by severe storms and pirates. To mitigate these risks, ship owners regularly sought out investors to proffer financing collateral for a voyage. In return, investors received a portion of the monetary returns realized if the ship made it back successfully, loaded with goods for sale. These are the earliest examples of limited liability companies (LLCs), and many held together only long enough for one voyage. The formation of the East India Company in London eventually led to a new investment model, with importing companies offering stocks that essentially represented a fractional ownership interest in the company, and that therefore offered investors investment returns on proceeds from all the voyages a company funded, instead of just on a single trip. The new business model made it possible for companies to ask for larger investments per share, enabling them to easily increase the size of their shipping fleets. Investing in such companies, which were often protected from competition by royally-issued charters, became very popular due to the fact that investors could potentially realize massive profits on their investments. Company shares were issued on paper, enabling investors to trade shares back and forth with other investors, but regulated exchanges did not exist until the formation of the London Stock Exchange (LSE) in 1773. Although a significant amount of financial turmoil followed the immediate establishment of the LSE, exchange trading overall managed to survive and grow throughout the 1800s. Enter the New York Stock Exchange (NYSE), established in 1792. Though not the first on U.S. soil – that honor goes to the Philadelphia Stock Exchange (PSE) – the NYSE rapidly grew to become the dominant stock exchange in the United States and eventually in the world. 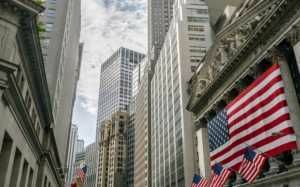 The NYSE occupied a physically strategic position, located among some of the country’s largest banks and companies, not to mention being situated in a major shipping port. The exchange established listing requirements for shares, and rather hefty fees initially, enabling it to quickly become a wealthy institution itself. Domestically, the NYSE saw meager competition for more than two centuries, and its growth was primarily fueled by an ever-growing American economy. 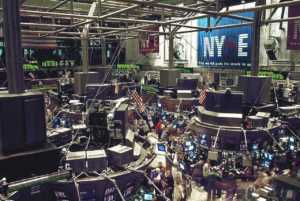 The LSE continued to dominate the European market for stock trading, but the NYSE became home to a continually expanding number of large companies. Other major countries, such as France and Germany, eventually developed their own stock exchanges, though these were often viewed primarily as stepping stones for companies on their way to listing with the LSE or NYSE. The late 20th century saw the expansion of stock trading into many other exchanges, including the NASDAQ, which became a favorite home of burgeoning technology companies, and which gained increased importance during the technology sector boom of the 1980s and 1990s. The NASDAQ emerged as the first exchange operating between a web of computers that electronically executed trades. Electronic trading made the entire process of trading more time-efficient and cost-efficient. In addition to the rise of the NASDAQ, the NYSE faced increasing competition from stock exchanges in Australia and Hong Kong, the financial center of Asia. The NYSE eventually merged with Euronext, which was formed in 2000 through the merger of the Brussels, Amsterdam, and Paris exchanges. The NYSE/Euronext merger in 2007 established the first trans-Atlantic exchange. 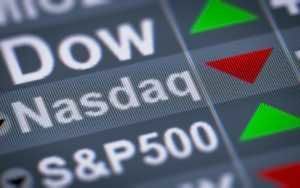 Most stocks are traded on exchanges such as the New York Stock Exchange (NYSE) or the NASDAQ. Stock exchanges essentially provide the marketplace to facilitate the buying and selling of stocks among investors. Stock exchanges are regulated by government agencies, such as the Securities and Exchange Commission (SEC) in the United States, that oversee the market in order to protect investors from financial fraud and to keep the exchange market functioning smoothly. Although the vast majority of stocks are traded on exchanges, some stocks are traded over the counter (OTC), where buyers and sellers of stocks commonly trade through a dealer, or “market maker”, who specifically deals with the stock. OTC stocks are stocks that do not meet the minimum price or other requirements for being listed on exchanges. OTC stocks are not subject to the same public reporting regulations as stocks listed on exchanges, so it is not as easy for investors to obtain reliable information on the companies issuing such stocks. Stocks in the OTC market are typically much more thinly traded than exchange-traded stocks, which means that investors often must deal with large spreads between bid and ask prices for an OTC stock. In contrast, exchange-traded stocks are much more liquid, with relatively small bid-ask spreads. There are a number of regular participants in stock market trading. Investment banks handle the initial public offering (IPO)Initial Public Offering (IPO)An Initial Public Offering (IPO) is the first sale of stocks issued by a company to the public. Prior to an IPO, a company is considered a private company, usually with a small number of investors (founders, friends, families, and business investors such as venture capitalists or angel investors). Learn what an IPO is of stock that occurs when a company first decides to become a publicly-traded company by offering stock shares. Here’s an example of how an IPO works. A company that wishes to go public and offer shares approaches an investment bankList of Top Investment BanksList of the top 100 investment banks in the world sorted alphabetically. 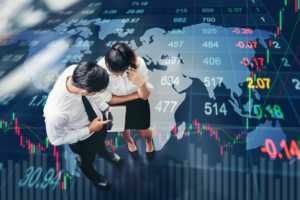 Top investment banks on the list are Goldman Sachs, Morgan Stanley, BAML, JP Morgan, Blackstone, Rothschild, Scotiabank, RBC, UBS, Wells Fargo, Deutsche Bank, Citi, Macquarie, HSBC, ICBC, Credit Suisse, Bank of America Merril Lynch to act as the “underwriter” of the company’s initial stock offering. The investment bank, after researching the company’s total value and taking into consideration what percentage of ownership the company wishes to relinquish in the form of stock shares, handles the initial issuing of shares in the market in return for a fee, while guaranteeing the company a determined minimum price per share. It is therefore in the best interests of the investment bank to see that all the shares offered are sold and at the highest possible price. Shares offered in IPOs are most commonly purchased by large institutional investors such as pension funds or mutual fund companies. The IPO market is known as the primary, or initial, market. Once a stock has been issued in the primary market, all trading in the stock thereafter occurs through the stock exchanges in what is known as the secondary market. The term “secondary market” is a bit misleading, since this is the market where the overwhelming majority of stock trading occurs day to day. Stockbrokers, who may or may not also be acting as financial advisors, buy and sell stocks for their clients, who may be either institutional investors or individual retail investors. Equity research analystsEquity Research AnalystAn equity research analyst provides research coverage of public companies and distributes that research to clients. We cover analyst salary, job description may be employed by stock brokerage firms, mutual fund companies, hedge funds, or investment banks. These are individuals who research publicly-traded companies and attempt to forecast whether a company’s stock is likely to rise or fall in price. Fund managers or portfolio managers, which includes hedge fund managers, mutual fund managers, and exchange-traded fund (ETF)Trading & InvestingCFI's trading & investing guides are designed as self-study resources to learn to trade at your own pace. Browse hundreds of articles on trading, investing and important topics for financial analysts to know. Learn about assets classes, bond pricing, risk and return, stocks and stock markets, ETFs, momentum, technical managers, are important stock market participants because they buy and sell large quantities of stocks. If a popular mutual fund decides to invest heavily in a particular stock, that demand for the stock alone is often significant enough to drive the stock’s price noticeably higher. The overall performance of the stock markets is usually tracked and reflected in the performance of various stock market indexes. Stock indexes are composed of a selection of stocks that is designed to reflect how stocks are performing overall. Stock market indexes themselves are traded in the form of options and futures contracts which are also traded on regulated exchanges. Among the key stock market indexes are the Dow Jones Industrial Average (DJIA)Dow Jones Industrial Average (DJIA)The Dow Jones Industrial Average (DJIA), also commonly referred to as "the Dow Jones” or simply "the Dow", is one of the most popular and widely-recognized stock market indices, the Standard & Poor’s 500 Index (S&P 500), the Financial Times Stock Exchange 100 Index (FTSE 100), the Nikkei 225 Index, the NASDAQ Composite Index, and the Hang Seng Index. Two of the basic concepts of stock market trading are “bull” and “bear” markets. The term bull market is used to refer to a stock market in which the price of stocks is generally rising. This is the type of market most investors prosper in, as the majority of stock investors are buyers, rather than short sellers, of stocks. A bear market exists when stock prices are overall declining in price. Investors can still profit even in bear markets through short selling. Short selling is the practice of borrowing stock that the investor does not hold from a brokerage firm which does own shares of the stock. The investor then sells the borrowed stock shares in the secondary market and receives the money from that sale of stock. If the stock price declines as the investor hopes, then the investor can realize a profit by purchasing a sufficient number of shares to return to the broker the number of shares they borrowed at a total price less than what they received for selling shares of the stock earlier at a higher price. For example, if an investor believes that the stock of company “A” is likely to decline from its current price of $20 a share, the investor can put down what is known as a margin deposit in order to borrow 100 shares of the stock from his broker. He then sells those shares for $20 each, the current price, which gives him $2,000. If the stock then falls to $10 a share, the investor can then buy 100 shares to return to his broker for only $1,000, leaving him with a $1,000 profit. Stock market analysts and investors may look at a variety of factors to indicate a stock’s probable future direction, up or down in price. Here’s a rundown on some of the most commonly viewed variables for stock analysis. A stock’s market capitalization, or market cap, is the total value of all the outstanding shares of the stock. A higher market capitalization usually indicates a company that is more well-established and financially sound. Publicly traded companies are required by exchange regulatory bodies to regularly provide earnings reports. These reports, issued quarterly and annually, are carefully watched by market analysts as a good indicator of how well a company’s business is doing. Among the key factors analyzed from earnings reports are the company’s earnings per share (EPS), which reflects the company’s profits as divided among all of its outstanding shares of stock. Price to Earnings (P/E) Ratio: The ratio of a company’s stock price in relation to its EPS. A higher P/E ratioPrice Earnings RatioThe Price Earnings Ratio (P/E Ratio) is the relationship between a company’s stock price and earnings per share. It gives investors a better sense of the value of a company. The P/E shows the expectations of the market and is the price you must pay per unit of current (or future) earnings indicates that investors are willing to pay higher prices per share for the company’s stock because they expect the company to grow and the stock price to rise. Debt to Equity Ratio: This is a fundamental metric of a company’s financial stability, as it shows what percentage of company’s operations are being funded by debt as compared to what percentage are being funded by equity investors. A lower debt to equity ratioFinanceCFI's Finance Articles are designed as self-study guides to learn important finance concepts online at your own pace. Browse hundreds of finance articles and guides to learn about the cost of capital, financial analysis, ratios, multiples, rates of return, profitability metics, and how to evaluate the overall, indicating primary funding from investors, is preferable. Return on Equity (ROE) Ratio: The return on equityReturn on Equity (ROE)Return on Equity (ROE) is a measure of a company’s profitability that takes a company’s annual return (net income) divided by the value of its total shareholders' equity (i.e. 12%). ROE combines the income statement and the balance sheet as the net income or profit is compared to the shareholders’ equity. (ROE) ratio is considered a good indicator of a company’s growth potential, as it shows the company’s net income relative to the total equity investment in the company. Profit Margin: There are several profit margin ratios that investors may consider, including operating profit marginOperating MarginOperating margin is one of the measurements used to gauge the return on sales generated by operations of a business. Operating margin is equal to operating income divided by revenue. Operating margin is a profitability ratio measuring revenue after covering operating and non-operating expenses and net profit marginNet Profit MarginNet profit margin is a formula used to calculate the percentage of profit a company produces from its total revenue. The profit margin ratio of each company differs by industry. Profit margin = Net income ⁄ Total revenue x 100. Net income is calculated by deducting all company expenses from its total revenue which is. The advantage of looking at profit margin instead of just an absolute dollar profit figure is that it shows what a company’s percentage profitability is. For example, a company may show a profit of $2 million, but if that only translates to a 3% profit margin, then any significant decline in revenues may threaten the company’s profitability. Other commonly used financial ratios include return on assetsReturn on Assets & ROA FormulaReturn on assets (ROA), a form of return on investment, measures the profitability of a business in relation to its total assets. The ROA formula is used to indicate how well a company is performing by comparing the profit it's generating to the capital it's invested in assets. The higher the return, the more (ROA), dividend yield, price to book (P/B) ratio, current ratioFinanceCFI's Finance Articles are designed as self-study guides to learn important finance concepts online at your own pace. Browse hundreds of finance articles and guides to learn about the cost of capital, financial analysis, ratios, multiples, rates of return, profitability metics, and how to evaluate the overall, and the inventory turnover ratioInventory TurnoverInventory turnover, or the inventory turnover ratio, is the number of times a business sells and replaces its stock of goods during a given period. It considers the cost of goods sold, relative to its average inventory for a year or in any a set period of time.. There are countless methods of stock picking that analysts and investors employ, but virtually all of them are one form or another of the two basic stock buying strategies of value investing or growth investing. Value investorsStock Investing: A Guide to Value InvestingSince the publication of "The Intelligent Investor" by Ben Graham, what is commonly known as "value investing" has become one of the most widely respected and widely followed methods of stock picking. typically invest in well-established companies that have shown steady profitability over a long period of time, and that may offer regular dividend income. Value investing is more focused on avoiding risk than growth investing is, although value investors do seek to buy stocks when they consider the stock price to be an undervalued bargain. Growth investorsStock Investing: A Guide to Growth InvestingInvestors can take advantage of new growth investing strategies in order to more precisely hone in on stocks or other investments offering above-average growth potential. seek out companies with exceptionally high growth potential, hoping to realize maximum appreciation in share price. They are usually less concerned with dividend income and are more willing to risk investing in relatively young companies. Technology stocks, because of their high growth potential, are often favored by growth investors. While new investment areas such as forex trading and cryptocurrencies continue to arise, stock trading remains the most popular form of investing worldwide among both institutional and individual investors.